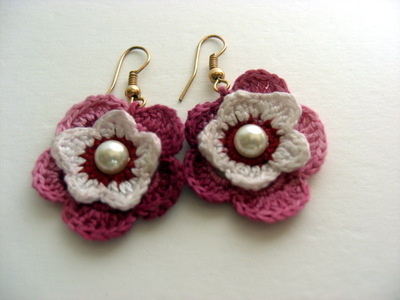 A traditional technique used for crafting clothing pieces, textile items for household use or decoration, crocheting has gradually turned into a way of creating handmade accessories. Floral patterns are often associated with this craftsmanship as they are great way of spicing up any piece of clothing, from sweaters, jumpers and jackets to gloves and headbands. Time: 15 minutes for a beginner, 5 minutes when you earn more experience. A fine hook – the size depends on the thread you are going to use. Cotton thread - pick a color that best suits the item you are planning to accessorize. Make a chain of 10 stitches. 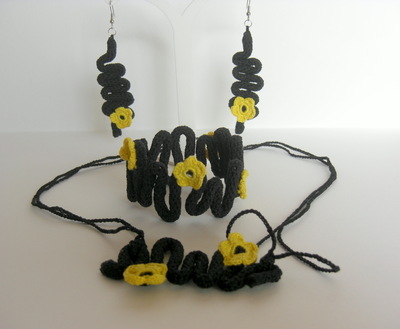 Crocheting a chain is actually the first step into this learning the basics of this handmade accessories crafting technique. In order to do this, first you have to make a loop. Pull the yarn through its center and insert the crochet hook into the new loop. Then, while holding the yarn over the hook, pull the yarn through the loop. Repeat the same movement 10 times. Now that you have the chain, connect the last stitch to the first one in order to obtain a ring. This is done using the same technique: insert the hook into the first stitch and pull the yarn through it and through the loop on the hook at the same time. The next step is to cover this ring with single crochet stitches – another basic technique you will use on a regular basis. Keep the yarn over the hook, pass the latter through the center of the ring and catch the yarn on the hook. Once you have two loops on the hook, pull the yarn through them. Repeat 20 times until the whole ring is covered neatly. In order to make the flower’s petals, you will have to know how to make single and double crochet stitches. Basically, they use the same technique. The only difference is that for a double stitch you have to wrap the yarn on the hook twice instead of once. For a single stitch, you wrap the yarn on the hook once, insert the hook in the underneath stitches (the ring) pulling the yarn through it. Now you should have 3 loops on the hook. Pull the hook through the first 2, then through the other 2, until you have a single loop on the stitch. So, let’s get started. The pattern looks like this: 1 single stitch, 4 double stitches, 1 single stitch (1 petal) 1 simple stitch between the petals and repeat. Insert the hook in the ring’s stitches twice, except for the connection between petals, when you have 1 stitch per loop. What you can do with the crocheted flower? Well, you can insert a hair pin in its center and wear it on your head. You can connect it to some earring hooks. You can sew it on a jacket, scarf of pair of gloves. If you have the patience to learn more complicated crocheting techniques, you can make really nice jewels with it.